As sweet as cinnamon: just Bliss! This arrived in the mail yesterday and I was so excited. 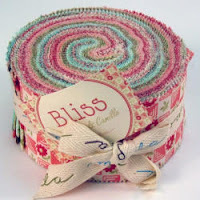 It's a Bliss jelly roll by Bonnie and Camille. and she has another jelly roll left and a few charms. Be quick though they will dissappear, they are so nice. It is so fresh and gorgeously girly, with red, pinks, blues and greens. Now to think of what to make with it. I agree with Terry! How pretty. What are you planning to make??? Any ideas yet? Gorgeous !! I brought 2 of those home with me. Hi Dawn, that jelly roll looks soooo pretty. I still haven't un"rolled" my very first jelly roll that DD got me for my Birthday/mothers day. It looks too nice to undo???? I'm sure you will be inspired to make something beautiful. Hugs, sandy. Jane had a bunch of these up at the Patchwork Apple yesterday. Very hard to walk past I must say! I love the colours of your Bliss jelly roll but it should have come home with me. Perfektný Bliss i celá Tvoja stránka! Si veľmi šikovná!